Donald Vitkus spent his childhood years in the 1950’s at the Belchertown State School, one of the large institutions for people with developmental disabilities that used to be common in Massachusetts, but have now largely been shut down. 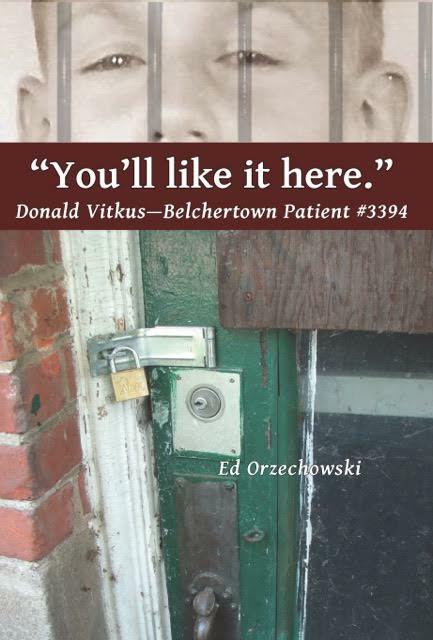 “You’ll Like it Here,” which is scheduled for publication on November 1 by Leveller’s Press of Amherst, MA, is the ironically titled story of Vitkus’s life, as told to Ed Orzechowski, a COFAR Board member and president of the Advocacy Network, an affiliated organization. A book signing is scheduled for Sunday, November 13, at 4 p.m. at the Florence Civic Center, 90 Park Street, in Florence, MA. In 2005, Orzechowski was assisting at a book signing at Holyoke Community College for “Crimes Against Humanity,” a detailed account by Benjamin Ricci of conditions at Belchertown and the other institutions prior to the 1970’s. Ricci had been instrumental in bringing about a class action lawsuit in that decade that resulted in major improvements in the care and conditions in the facilities. Following that 2005 book signing, Orzechowski says, a member of the audience approached him. It was Vitkus, then a 62-year-old student at HCC. Vitkus had actually been responsible for arranging Ricci’s talk. Vitkus told Orzechowski he had grown up at Belchertown, and was looking for someone to help him write his life story. That conversation evolved into Orzechowski’s book. Vitkus is now an advocate for people with developmental disabilities and is vice president of the Advocacy Network. Vitkus was sent by a foster family to Belchertown in 1949, when he was six years old. He had a tested IQ of 41 and was labled “a moron” in the state school records. But as you read this account, you realize just how faulty IQ tests can be. In fact, Vitkus and many of his fellow “inmates” at Belchertown had to use their wits to survive there. You may marvel, for instance, at the ingenuity Vitkus and a handful of other boys used in a number of instances to light cigarette butts they had found, using only an empty overhead light socket in a boys bathroom and a strand of steel wool. Matches were forbidden. As I read this story, I got the impression that there are actually two main characters in it. The primary character, of course, is Vitkus. But I found myself viewing Belchertown as a character as well — it’s a brooding presence throughout the book. Belchertown is the evil institution incarnate. It is Vitkus’s triumph that he was able to survive Belchertown and get on with his life, and ultimately to help others in the largely privatized group-home system that has replaced the large institutions. This is a gritty book, and a disturbing one. It is not for the faint of heart. Some of the incidents are mind-numbingly horrifying. What Vitkus and so many others went through at Belchertown in the 1950’s was the result of an attitude at that time that people with intellectual disabilities were not only sub-human, but that horrendous things could be done to them without fear of retribution. The residents were abused and treated as prison inmates by many of the staff. The place was overcrowded and unsanitary. Beyond the abuse, there was an attitude at Belchertown at the time that few of the people living there had any potential to live outside of the institution, or any need to be treated with basic human dignity. For instance, the residents were not even allowed to receive Communion in Catholic services that they attended at Belchertown. And yet, there were exceptions to the prevailing conditions and attitudes at Belchertown: The actual school on the grounds was a haven for Vitkus. Unlike most ward attendants, the teachers in the school were encouraging, he notes. There were occasional outings from Belchertown as well — to the Belchertown Fair and to Camp Chesterfield, a boy scout camp. But Vitkus’s experiences at Belchertown were mostly hellish. At one point, he began refusing to take mind-numbing Thorazine and bit off the finger of an attendant who was trying to jam the pills down his throat. He spent 34 days in solitary confinement as a result. “Lithium and Thorazine were chemical restraints used to supplement leather straps,” he states. In 1960, Vitkus was “paroled” from Belchertown at the age of 17, after graduating from the sixth grade at the school. His IQ now tested at 80, and he was sent to a program run by the Catholic Church called Brightside. Conditions there were remarkably better than Belchertown had been. There was no one there to force meds down his throat, Vitkus notes. But Vitkus was clearly smarter than his stated IQ. After he did leave Belchertown and was living on his own, he bought a set of the Encyclopedia Britannica from a salesman and proceeded to read it. But he was dogged by the state having classified him “as a moron.” His draft card read 4-F, which meant he was unsuitable for the military. That 4-F classification was so offensive to him that he resolved to change it; so he went to the local draft board office and got it changed to 1-A. He was eventually shipped off to Vietnam where he first served as a cook for the Army, then engaged in combat and lost his buddy who was killed in a firefight. Combined with the experience of Belchertown, Vietnam resulted in continuing guilt feelings and posttraumatic stress disorder for him. After his return from Vietnam, Vitkus got married to a young woman whom he’d met while he was a resident at Brightside. They had two children, a boy and a girl. He also took night classes at a local high school and received a high school diploma. Yet the wounds inflicted by Belchertown were always still there, even in his marriage. He was incapable of affection with his wife and could not relate in basic ways to his kids, and they all resented it. Eventually, his wife filed for divorce. Vitkus later reconnected with his son, Dave, who became a police officer in Northampton, and the two of them went on an exhaustive hunt together for information about Vitkus’s past. They first went back to Belchertown, which was then in the final process in the early 1990’s of closing, and later to court houses across the state for information about Vitkus’s mother and family. With the help of a probate court investigator, they eventually found two of Vitkus’s sisters and a brother, with whom he reunited. At the age of 52, Vitkus remarried. But his past still wouldn’t let him be. When his son Dave applied for a sensitive federal job, Vitkus was questioned during the background check by FBI agents. The agents, who knew about Vitkus’s background, interrogated him regarding some unsolved crimes. It was another reminder that his past was still a part of who he was and who people perceived him to be. Vitkus eventually lost his job due to the continuing decline of the manufacturing industry in western Massachusetts. But it was the beginning of a new career in caregiving to people with developmental disabilities. He earned an associates degree in human services at Holyoke Community College — his college education was funded by the company that had laid him off. He began working in a group home and took on a difficult resident there in whom he recognized potential as well as some of his own character traits. For me, this book highlights a key irony in the history of Belchertown and the other facilities like it in Massachusetts. The irony lies in the aftermath of the class action lawsuit that Ben Ricci filed in the 1970’s with the help of Beryl Cohen, a Boston attorney, who was the 16th attorney Ricci had approached. The federal court case was overseen by U.S. District Court Judge Joseph Tauro, who required major improvements in care and conditions in the facilities. While the state ultimately spent hundreds of millions of dollars to upgrade the institutions and the care provided in them, governors of Massachusetts began a major push starting in the 1990’s to close those same facilities and privatize their services. …knows that abuse and neglect still exist in the system. Battles involving agencies like the Massachusetts Department of Developmental Services, privately contracted vendors, families, whistle blowers and advocates continue—often in court—across the United States. Ultimately, “You’ll Like it Here” is an uplifting account of the life of a man who survived some of the worst experiences life has to offer. If you want to get a sense of what it was like, and what it took to survive, in large institutions before the intervention of people like Ben Ricci, Beryl Cohen, and Judge Tauro, you should read this book. Can it really happen in America that the state can take an individual into its custody, and then not even let that person’s family know where she or he is, for months on end? Yes, that is apparently the case if the individual is mentally ill or intellectually disabled. In one of the more bizarre and severe instances of restrictions placed by the state on family contact, a court-appointed guardian has banned family members of an intellectually disabled woman from all contact with her because they allegedly became too emotional when they visited her. The 28-year old woman, whose name we are withholding, is dually diagnosed with intellectual disability and mental illness. The woman’s father, David, and sister, Ashley, have not even been told for almost a year where she is living. Clinicians in at least one hospital said the family was to blame for signs of agitation and psychotic symptoms allegedly shown by the woman after the family visits. The ban on family contact was imposed after the woman alleged that she had been sexually assaulted by the alleged boyfriend of her mother over a two-year period from 2012 to 2014. The woman’s mother, Nancy Barr, and her alleged boyfriend, John Leone, have both been arrested and are facing trial in Salem Superior Court in connection with the alleged assaults. In addition to banning Leone and Nancy Bar from visiting the woman, a guardian with the Department of Developmental Services last Thanksgiving extended the prohibition to other family members and a family friend, who have not been implicated in the alleged crime. The only family member who is currently allowed to visit the woman is a maternal aunt, who Ashley Barr said had little prior contact with the woman and maintains little contact with either Ashley or her father. The Barr’s case is, unfortunately, not unique. We have reported on other cases (here and here) in which family contact with developmentally disabled family members has been severely restricted by the Department of Developmental Services. These restrictions also appear to happen in cases in other areas of the health care system, such as the highly publicized case of Justina Pelletier, who was held for nearly a year in a locked ward in Boston Children’s Hospital, and kept from all contact with her parents. “This is unfortunately yet another case in which DDS and the probate court system has failed families of developmentally disabled persons,” said Colleen Lutkevich, COFAR executive director. “The family always seems to be made the focus of blame when problems occur. David and Ashley have tried for months to get answers from the Department of Developmental Services and from the Department’s court-appointed guardian for the woman, and have gotten little information from them. They have gone to their local legislators and gotten little help, and have even gone to the media, but have been unable so far to get any news outlets to report their story. Neither David Barr nor any other members of the woman’s family, other than her mother, are alleged to have known about the alleged sexual abuse while it was happening, and none have been charged or implicated in the crime. David Barr was divorced from Nancy Barr in 2003. During the period of the alleged assaults, the woman had been under the care of her mother and had been living in her mother’s home. David Barr said that Nancy Barr has also been diagnosed with mental illness. After the woman told a family friend about the alleged abuse in 2014, the friend reported the matter to police, and the woman was immediately removed from her mother’s care. She was apparently placed in a shared living arrangement in Haverhill, but that location was not disclosed at the time to any other members of the family. In the months that followed, the family was only sporadically informed about their family member’s whereabouts. Her sister, Ashley, and her father said that virtually no information was provided to them for the first month after her removal. They were then allowed to visit her only a handful of times, either at a DDS area office or in Massachusetts hospitals to which she was admitted, reportedly after psychotic episodes. Ashley Barr currently lives and works in Rhode Island. Last Thanksgiving, the DDS guardian, Dorothy Wallace, a psychiatric social worker, terminated all family contact with the woman. Ashley said she and her father have not been permitted to visit or call her for nearly a year, and they don’t know where she is currently living. Wallace, the DDS guardian, has declined to speak with COFAR regarding the case. In statements she provided in probate court in August 2015, she said she ordered that the family’s contact with the woman be restricted at that time because her father and sister would become overly emotional during visits with her. Wallace said clinicians in various hospitals in which the visits took place complained that the woman would be agitated and upset after the visits and that her symptoms of bipolar disorder would then become aggravated. Wallace and Jill Casey, the woman’s DDS service coordinator, testified in the August 2015 probate hearing that their goal was to reunite her with her family once she was “clinically stabilized.” However, as of October 2016, more than a year later, the family has received no word from DDS as to when or if such a stabilization has occurred. Ashley Barr said her calls and text messages to both Wallace and Casey have gone unanswered. DDS Commissioner Elin Howe responded to an email from COFAR about the case on October 6, and would say only that the case was under review. However, as of today (October 19) neither David nor Ashley had been contacted by the Department as part of that review. Ashley acknowledged she and her father did become emotional at times during visits with her sister because she appeared upset at being kept isolated from them and often appeared to be over-medicated. In one of the last instances in which they were allowed to visit the woman, Ashley said it appeared she had not been bathed. Ashley personally gave her a shower at the hospital. Her hair was so dirty and matted, Ashley said, that she had to use an entire bottle of shampoo and conditioner to untangle it. Like many probate cases, this case has a complex history. David Barr has tried without success to gain guardianship of their family member following David’s divorce from her mother. In early 2015, the Essex County Probate Court passed over David and a long-time family friend, who had offered to be his daughter’s guardian, and instead appointed Wallace, the DDS-paid psychiatric social worker, who had never met the woman, as her guardian. David Barr said he would have supported the family friend as his daughter’s guardian, but “we were totally ignored.” Barr has since filed a new petition for guardianship in probate court. Ashley added that her father was not liked by some of the staff of his daughter’s day care provider agency because he would become angry and reprimand the staff following several instances in which she walked out of the provider’s facility unattended. Then, in November 2014, Ashley was contacted by Jill Casey, the DDS service coordinator, who said she would be allowed to visit her sister at the DDS area office in Lawrence for about an hour. David was not invited to that visit. Ashley said she was told during the visit not to ask her sister any questions about where she was living. She said her sister “looked scared,” and said several times that she wanted to see her father and to come home. A family friend, who was allowed to visit the woman around this time, said she was living in a home in Haverhill owned by a woman who had two or three other developmentally disabled persons living there. The friend said she was instructed not to tell anyone in the disabled woman’s family where she was. The friend said she was allowed on one occasion to take the woman out of the Haverhill home for the afternoon. The woman was upset, she said, because she wanted to see her family. She also wanted to sleep over at the friend’s house, but that wasn’t permitted by the guardian. It wasn’t until April 2015 that Ashley was next allowed a visit with her sister – this time in Arbor Fuller Hospital in Attleboro, where she was scheduled to celebrate her 27th birthday. Ashley said she was allowed a number of visits to Arbor Fuller, and David was allowed to visit as well, though a lesser number of times. It was apparently at Arbor Fuller, that Ashley and David first reacted too emotionally when they saw her. In testimony in the August 2015 probate court hearing, Wallace, the guardian, contended that David Barr further agitated his daughter during at least one visit by telling her that she would be going home soon and that he would become her guardian. Hospital clinicians, Wallace said, subsequently asked her to terminate the family’s visitation privileges. During the probate court hearing, Wallace, Casey, and Barbara Green Whitbeck, a DDS attorney, repeatedly stated that they considered it necessary to “educate” David, Ashley and potentially other family members about what was in the woman’s best interest and the extent of her mental illness. In June 2015, Ashley found out from her aunt that her sister had been admitted to Lawrence General Hospital because her psychiatric symptoms had flared up. Ashley was subsequently allowed to visit her a handful of times at Lawrence General, but David wasn’t, for reasons that were not provided to them. After a short stay at Lawrence General, the woman was admitted to Tewksbury State Hospital. Ashley said that when she was living in Connecticut at that time and drove up to Massachusetts several times a week to visit her. David was finally allowed to visit her at Tewksbury State in October 2015. She appeared drugged during that visit as well, according to Ashley. And that was the visit in which Ashley said she needed to use an entire bottle of shampoo and conditioner to untangle her hair. Ashley did manage to see her sister without permission at Tewksbury State in December when she visited under an assumed name. She gave her Christmas presents during that visit. It was the last time she would see her. 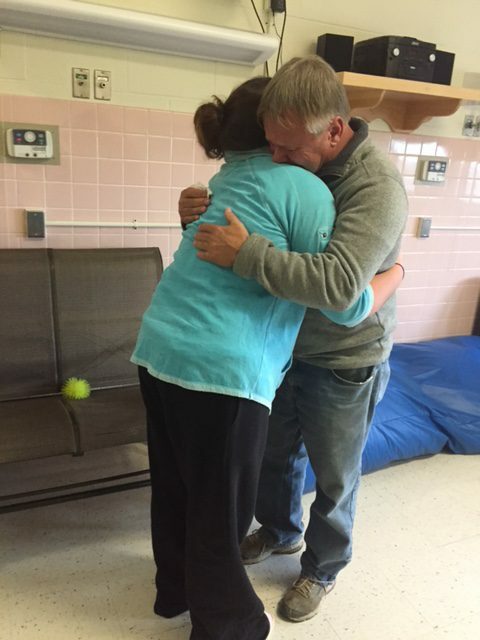 David and his daughter hug good-bye at Tewksbury State Hospital. In May, Ashley found out she was pregnant and learned that she was going to have a girl. She contacted the guardian to ask whether her sister would be allowed to come to the baby shower, which was planned for a restaurant in Andover. She said Wallace denied the request and told her that her sister would not be informed that she was pregnant. The family friend who initially reported the alleged sexual abuse of the woman to police had initially been allowed to visit her, as noted earlier. However, when the friend tried to visit the woman at Tewksbury State in April on her 28th birthday, she was told that she was no longer there. The friend said she was also told by a staff member at the hospital that she too had been placed on a no-visitor list. She said she was not given a reason for that prohibition. The friend said she understood that the only family member still allowed any contact at that point with the woman was the aunt, who had previously had little to do with her. Ashley said David did hear from his daughter one last time in July when she apparently managed to find a cell phone and called him. She said the cell phone had a New Hampshire area code, but that the woman did not know where she was. The call was terminated after two or three minutes, she said. When we at COFAR heard about this case, we contacted the office of David Barr’s local House member, State Representative Linda Dean Campbell. Both Ashley and the family friend had previously contacted Campbell’s office, but a staff member in the office indicated at that time that the office could do little to help them. When we contacted Rep. Campbell’s office earlier this month, the staff member did offer to contact DDS on behalf of the Barrs. The staffer reported back that DDS would not discuss the case with Campbell’s office, but would pass along Campbell’s concerns to others in the Department. You can contact Rep. Campbell’s office at 617-722-2430, or send an email to Linda.Campbell@mahouse.gov, and urge them to continue to try to work with DDS to resolve this case. In addition, you can contact Governor Baker’s office at 617-725-4005; and DDS Commissioner Elin Howe at 617-727-5608; or email: elin.howe@state.ma.us. Say you believe David and Ashley’s visits to their family member should be restored immediately. Also, let them know that you hope and expect that as part of their review of the case, DDS officials will contact and interview both David and Ashley.